from the first smack of the opening break to the satisfying sound of the winning ball dropping in. Pool tables are rented by the hour, so there’s no need to bring a pocket full of quarters and you won’t be challenged for your table. Whether you’re super competitive or just like a friendly game with lively conversation, Flattop is the perfect venue. Our Olhausen tables are impressive enough for the serious shooter, but our laid back vibe will make even the most casual player comfortable. 8-ball. 9-ball. We’ve got it all. We’re all about fun at Flattop Pizza + Pool, but we take pool very seriously. That’s why we feature Grand Champion 3 tables by Olhausen Billiards. These beauties are eight feet of sturdy, elegant design. With a diamond-honed 1” thick slate, these tables are built for the pros and have an authentic billiard hall feel. They’re definitely not the typical crapola bar table. 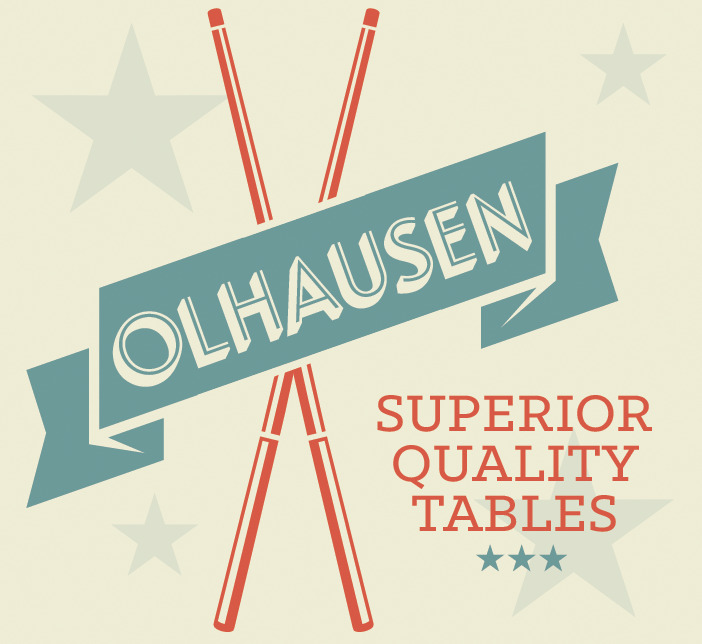 Olhausen has been manufacturing top of the line tables for over 40 years right here in America. Respect the table, but have fun! Have a pool & pizza party!